I’ve had almost a week to absorb and process the wonder that was last Sunday’s Spring Clean workshop with the beautiful Lora McCarville here in Hastings. And finally I have a few spare moments to write about it here…. The day itself was less than beautiful. We’re talking cold rain pretty much ALL day and even snow and slushy crap at other times. It was very nervous making for me as I had people traveling in from hour(s) away for the event and I was very anxious about everyone making it here safely. But that’s the thing about Nebraskans – we are a hearty bunch and when it comes to getting some time to check in with our heads and, more importantly, our hearts, we don’t let a little snow + showers on April freaking 30th stop us. No way. Every single person made it and on time and so we got to enjoy the warmth of the Prairie Loft Pavilion and the teachings of one of my absolute favorites all together, just as we were meant to do. Call me a fan girl all you want. I don’t hide that because every time I get to sit and talk with and learn from Lora, I take away new a-ha’s and gentle reminders of wisdom I already carry with me, and all of us need people in our lives who can be those sources for us. And as everything came together for Sunday’s workshop, despite the weather obstacles and challenges of coordinating such an event from a business perspective, I can say that once again I landed right where I needed to be that afternoon, hearing perspectives that I very much need in my life these days. When I found out I was pregnant with Baby No.5, I had this notion that I was going to ROCK IT with staying on top of yoga, meditation, and overall fitness. Perhaps this is because I was just coming of my 3/5 Challenge, but I really thought I was going to yoga, meditate, and walk/prenatal fitness DVD a certain number of days each week starting from right there in week 4/5. As in, I was going to be the most fit and functional I’ve ever been. With Baby No. 5. And then reality smacked me in the face (or rather in my tired brain and upset stomach) and no. That has not happened. I’ve kept up with my teaching and some of my household duties, but beyond that? Whoa. Let’s just self-care becomes much harder to achieve when your body and brain feel like they are locked in survival mode. And then the guilt comes because you know if you could just do something to take care of yourself, you’d probably feel better, but you don’t have enough gumption to do anything and so on and so on. But here is what Lora reminded me of last weekend: The Magic is in Coming Back. That can apply to so many facets of life and of a yoga practice. It can mean coming back to the mat or the meditation cushion. It can mean coming back to yourself and your center. It can mean giving yourself some grace and space (especially under extenuating circumstances). It can mean – and mostly means – coming back to the breath. When the thoughts take over, come back to the breath. This is not a new concept for me; it’s something I’ve been working on for years. But this reminder of what I needed, exactly when I needed it was a true blessing and gift because it confirms what I have said all along – this is a life long practice. There is no perfection. There is no mastery. It is always a practice. It is always about returning. And therein lies the progress. The compassion for self and others. The true magic. So I’m working on it. I’m getting my feet back underneath me and making a gentle return to gentleness with myself, and eventually I’ll re-establish those practices that guide and ground me. And I’ll give thanks as I do so – for my teachers, my champions, my magic. Before you get after my math there in the title, let me explain. Remember the challenge I set for myself back in December? The one where I would do the yoga at least 3x a week and the meditation at least 5x a week for approximately 3.5 months? Well, that time frame has suddenly come to a lightning quick end with today, my 35th birthday. Ca-ca-crazy, huh? Even crazier (awesome)? I did it! With the exception of two bouts of illness, I kept on track and rocked the heck out of this self-care routine and I am so, so glad I did. Getting through the holidays and starting a new semester while also starting a new business on top of momming meant the start of 2017 was intense. It would have been pretty easy to spiral into a giant stress ball, and truth be told, I probably still did a bit on some days. 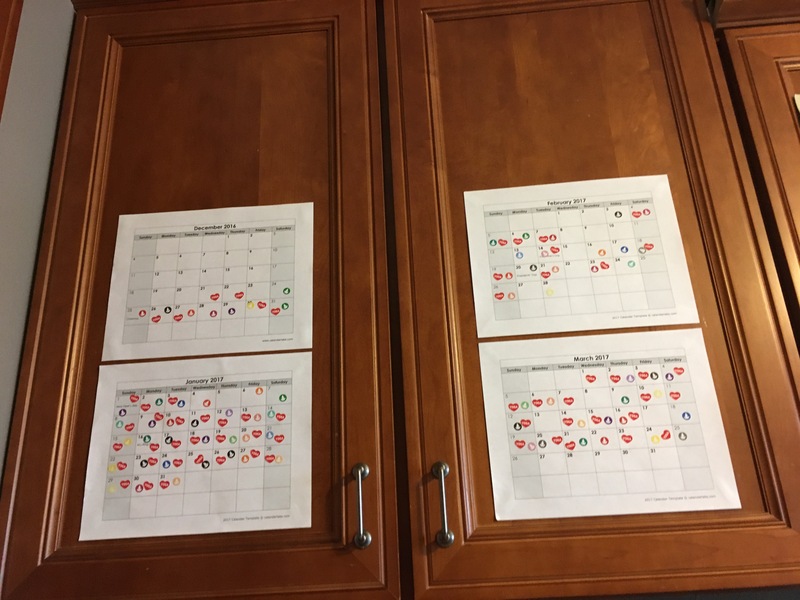 But the challenge and the accountability calendars kept me going and kept me tending to ME in the midst of all the others, which, as you all know, is incredibly important. You have to have your own back. And you have to do whatever it takes to keep you having it. For me that was totally the tracking system. As visual as I am, these were essential reminders and motivators over the last few months. Side note? See all those Wednesdays I skipped in February? Bad idea. Wednesdays are honking busy days for us – short day of school, after school church stuff, one of my lecture nights on campus – and I felt like I was dragging myself into most Thursdays that month like “I did it! I survived!” which is good but not the best approach. So even though I didn’t practice one or the other every Wednesday in March, I tried to do at least a little more preemptive care because whoa – hectic overload in February. 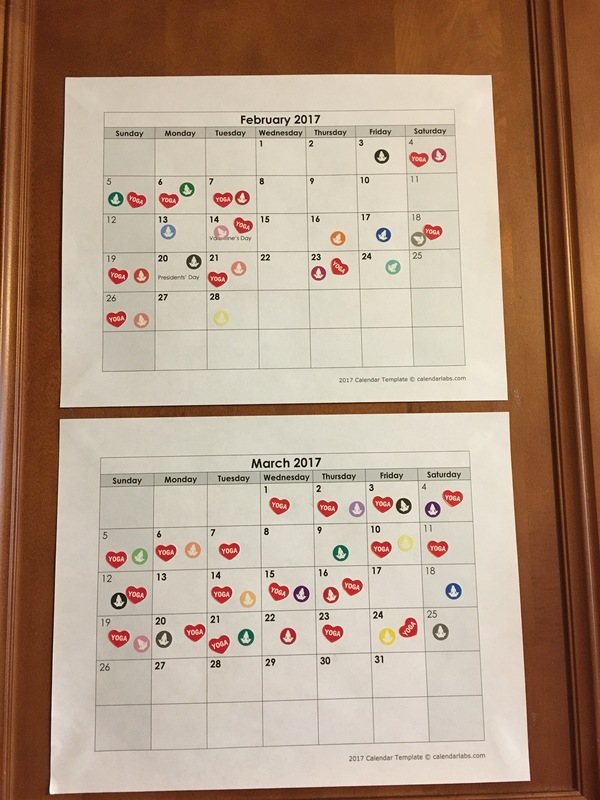 I don’t know that I would have noticed this pattern/bad habit if not for the calendars front and center to display it. What happens from here? Well, I think I’ve got a new challenge in mind, but I’m still figuring out the specifics. It will definitely still include as much meditation as reasonably possible, and yoga too, of course, but as the weather improves, I’d like to start including some walking and other strength training in there too. That way, even when I run into days when it’s hard to find time to roll out my mat, I can still get some good in that’s just for me. Ahhhh, 35. You came faster than I ever could have imagined by wow, do I think there is great potential for you to be the most transformative year yet. But yes, stickers are still totally going to be needed, because some parts of a person never grow up! It occurred to me that it had maybe been a while since I posted anything here, and when I went to look, I was shocked to see that it has actually been two weeks since I last wrote on the blog. That never happens! But then again, there has been so much going on with the business and the babies (they all get so mad at me when I call them that. I mean, look; I’m never going to stop, so they may as well get used to it now) that I guess it’s not so surprising that something got overlooked. Poor little blog; it’s been such a sweet and safe spot for me over the years, I certainly don’t mean to overlook it. And actually, I’ve been writing, but just in other places. I had a new post go up on HVFH last week and I’ve also started a blog through Grounded Sky (which is probably how I missed the fact that I hadn’t written here lately), so if you’d like some stories and musing, you can go HERE. Or HERE. Or even HERE. Those will catch you up rather nicely on all the haps. And as for keeping up with keeping tabs, I guess I will just have to keep on keeping on. It all can be done! Ooooh, which reminds me – who doesn’t love a little music on Monday? Want a good one? Listen to this by Nahko! Scrub It All Away? Kinda. To say that starting your own business is a lot of work is a gross understatement. To say that starting your own business while also momming for 4 and adjuncting for almost 40 and inadvertently scheduling ALL the social things possible in a 3-week time period is not easy? Yes, also gross. I mean – a gross understatement. Because there’s nothing gross about the work I am doing, on any of these levels, but wow, did everything slam into me this week. Pick any of those four categories from above and there’s a lot to do. A lot going on. And the problem is, the four categories seem to be pulling at each other a bit, much like siblings who should just sit nicely together on the couch, but instead can’t help digging an elbow or quick pinch or giving some other disturbance to another. Take today. Today is Thursday. It is meant to be one of my two blissfully quiet-for-almost-two-hours-while-the-baby-naps-in-the-morning mornings that I get each week. This is a time for the adjuncting and the business and for the just being a person to shine. But today, LT woke up with a head too stuffy to send to school (for fear of infecting those around him, more than anything), so there went my hopes of accomplishing much, because even if I give him screen time during nap time, he’s still right there next to me making it hard to work on my marketing plan or website. But as you all know, our categories aren’t children on a couch and they aren’t created equal. They might be loved equally like children, but there’s no way you can look at your kids and say, would you PLEASE just give me two (nope, I want ten) hours alone so I can THINK and WRITE and DO all the things that need to be done? Parenting just doesn’t work that way. So instead, I closed the computer, got the baby up from nap, and let the two littlest Littles roam around the kitchen and main floor while I did the dishes and then moved on to a project I have been meaning to do for weeks – thank yous for our friends who helped us during Norovirus Hell 2017. Because I quit coffee, I had to find something to do with all the left over coffee supplies, so I combined the leftovers with Pinterest and thank yous, coming up with the idea to make coffee scrubs for all those who helped. I finally (finally!) got around to picking up some cute jars yesterday, so this morning – when my hands and brain couldn’t quite work on what they wanted to – I did something else productive and full of love. Incredibly, it was all very, very simple, too! Can you believe that, all while tending to and snack/feeding the wandering children hovering around my legs, all three recipes start-to-in-the-jar took less than an hour and a half? I don’t often trust recipe times online, but I promise you – these were all so simple to do, even in the midst of heavy distraction! There are still a great number of To Dos on my list and in my brain, but I am glad that this lovely little chore is done. It was easy peasy lemon squeezy, and I hope that those who receive them really know just how much we appreciate their care, concern, love, and support. As for all that other stuff? Well, I’ll keep plugging along and it all will be done. And not just eventually, but SOON. Because good things are coming! And Water Bringers, your good stuff is coming your way soon also – I hope you enjoy! To be honest, I’m not sure which statement to insert here. Wowzers? Holy Moly Cow? FFS? Perhaps just take your pick, OK? Whatever you choose, the sentiment is the same – it’s been a big week in our world during the last seven days and I, for one, am worn out. Physically, yes, but emotionally and mentally, too. And not all of that is to blame on our current political climate (although some – most? – of it most definitely is). Some of the ups and downs of the last week are just normal run of the mill Whoas. Maybe you feel the same? To keep this from turning into a laundry list post, I’ll stick with what happens from here. Meaning, I’m doing my darndest to figure out how to Do All The Things that really need doing right now and letting the others go. It feels like more information than ever is flying my face right now and I want to stay involved and engaged. I really do. But for crying out loud, my heart and my brain can’t keep up with the slog of social media right now and I’ve got to give myself some space so I can navigate my current teaching commitments, hammer out my future business plans, and secure my own sanity. As promised, I will ostrich no more. I’m committed to that – so much so that me, the person who HATES (and does not use that word) making phone calls, has started weekly phone calls to my senators’ offices to voice my concerns. But I can’t read every article or status or argument out there right now because it’s too, too much. That means I need to disengage for a bit, but not completely and not for long. I’m thinking two weeks. Maybe one. During that time period, I need to quit the obsessive scrolling and reading online. That means no more Facebook. Well, not no more at ALL, but no more scrolling. I’ll still check messages and notifications (so write me or tag me if you want me to see something, m’kay? ), and I’ll still be post pics, I’m sure, but the scroll bar stops there. It must. I’ve got some important goals to meet for Grounded Sky in the next two weeks (eek! Cannot WAIT to share more on that with you soon! ), too, so it feels like a perfect storm for stepping back a bit. Do I anticipate that being easy? Nope. But it’s a baby step I’m taking temporarily starting tomorrow because I need some way to give myself some time and space to process. The work (in many ways, on many levels) continues. I hope yours does, too! For months (and months), big things have been a’brewin’ over here. There has been a whole lot of talking and dreaming and brainstorming and planning and yes, best of all -DOING going on, about which I am so excited to finally begin sharing with you. As you know, if you’ve been reading along the last several months, I have continued to teach yoga as a solo instructor, both on my sun porch and eventually in a friend’s space once we outgrew the porch. Those classes have brought so much joy and I am profoundly grateful to those who have practiced with me in that time. What I am excited to share with you all now is that this little solo side-gig thing is going full blown, legit small business. Yes, that’s correct! I am now the proud co-owner (along with my amazing hubs) of my (our) very own L.L.C. – Grounded Sky – a little yoga biz with big heart and big dreams. There is much to tell and much to share, but in due time. Official filings and openings (think legal paperwork and bank account) are now in place. The classes and other special offerings are also very much in the works, along with collaborations with some amazing souls (who have already given such great support, not to mention brain power! ), but it’s too much for one little post to carry, so for now – I’ll leave you with a big dose of excited to be adulting and learning in whole new ways. Cheers to 2017! What I am about to say is totally self-aggrandizing. What is the “big” deal, exactly? I am killing it with this self-imposed, self-created yoga and meditation challenge. And that, right now, feels worth sharing. Worth documenting. Several of you have checked in to update me on your own goal/challenges/progress which I love and I hope you will continue (or start) to do that. We can gather great accountability from one another, not to mention inspiration and motivation. When I began this in December on the Solstice, I had no idea that I was going to do a 31-Days yoga bit in January, but once it started, I knew I was down, dog (oh my). Of course, as you may remember, after just three days of the new year, the flu swept through our entire household, and while I did manage to keep my goal for that week overall, I missed four days of my yoga challenge. What I didn’t share in the last blog post about this, however, was how dang disappointed I was about that. Like oddly, really bummed out by being “behind” the rest of the YWA group. I was happy to be back at it, but I wanted to be at the forefront again. Pride in having started on Jan. 1, perhaps? I don’t know. And then I decided, it didn’t really matter that I had to take four days off; what mattered was how I proceeded from there, and if ever there was a teacher or group who would appreciate the Go Your Own Way approach, it was the #yogarevolution bunch. Adriene’s mantra is Find What Feels Good; I mean, c’mon! And what was my own way? I decided to double up videos (each is roughly half an hour, so doing two in a day meant no different than a regular hour-long class), and slowly, over the course of the last week (which also happened to be my first week of back to teaching – CCC and yoga AND COFFEE-FREE), I did just that, and got caught up yesterday (on Day 15) right where I should have been (and clearly wanted to be) pre-Norovirus. And dang it, doing so doesn’t feel good – it feels GREAT. Because when you yoga countdown, you <3, not X out the days. I mention all of this because with any goal we set ourselves, please remember that the journey and the unfolding are where the growth happens. It is never, ever going to look like you think it will at the beginning. And that is OK. You can adjust. You can start again. You can catch up or re-vision or even undo. You really can make it your own. And from there, you show yourself what your true powers are. And trust me when I say that taking time for you – for meditation or yoga or running or writing or whatever it is that you do that makes you more you or a better you – is not easy. I think with time and practice, it can get easier, but you have to stay committed. And when you do, by all means, celebrate, document, and self-aggrandize away!